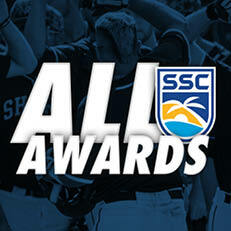 MELBOURNE, Fla. – Nova Southeastern dominated the All-Sunshine State Conference player selections on Wednesday, landing six players on the two combined teams, including a league-best five on the All-SSC First Team. One of five Sharks on a stout list of first-team members, first baseman Dylan Harris collected his fourth career All-SSC recognition. 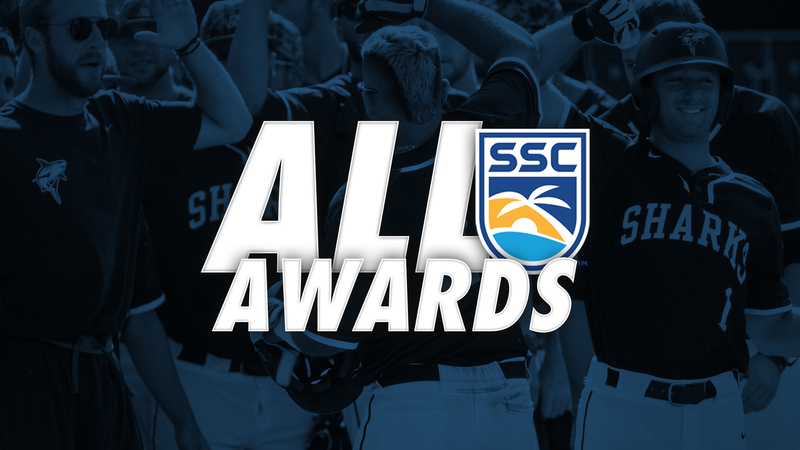 Harris was joined by Jake Anchia, Devin Conn, Samuel Duran and Andrew Liberty on the first team, while starting pitcher Brady Acker was named to the All-SSC Second Team. After arriving at Nova Southeastern for his final year of eligibility, Harris has appeared to only get better in 2018. The Sharks’ lead-off batter not only led the league in hits (88) and runs scored (67), but just last Thursday became the SSC’s all-time career hits leader, surpassing a mark that previously stood for 18 years. Harris also ranked among the Top-3 in the SSC in batting average (.413) and stolen bases (28), while adding a career-high nine home runs. The Land O’ Lakes, Fla. native enters postseason play on a current, program-record 32-game hit streak. Lofty expectations were set for Anchia entering his draft-eligible junior season, and all the catcher has done is live up to the billing. Anchia rightfully lands on the first team after winning two-thirds of the SSC Triple Crown with league-highs in home runs (21) and RBI (62). Of his 21 bombs, 14 were hit during SSC play while three others came against then-No. 1 North Greenville, including a walk-off blast that secured the series victory for the Sharks over the Crusaders. Anchia registered four multi-homer games this spring and continues to extend his lead as the all-time home run leader in program history. Conn set the tone for a fascinating sophomore season on Opening Night, and has still yet to look back. 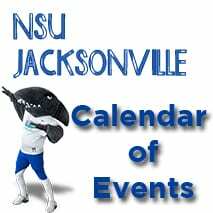 In 14 starts, the electric right-hander has posted a record of 8-1 with a 4.01 earned run average and a gaudy 128 strikeouts, which rank second in all of NCAA Division II and second only behind current Detroit Tiger Mike Fiers for most in a single season at NSU. Conn has racked 10-plus K’s in half of his starts, including a season-high 15 versus Tampa, with four such efforts coming in his previous five outings. His eight wins lead the Sharks’ pitching staff. Duran needed a bit of time to find his rhythm to begin the season, but has since caused nightmares for opposing pitching staffs. In his first season as a Shark, the junior from Melbourne, Fla. has worked his way into sixth in the SSC in batting with an impressive average of .392 that has been boosted by a recent 23-for-44 stretch at the plate. Along the way, he has collected five homers and 33 RBI to couple with 13 stolen bases. The offensive numbers rightfully overshadow his defensive ability, yet the outfielder has also been selected as a nominee for a ABCA/Rawlings Gold Glove. Choosing to return for a fifth year in 2018 proved to be a wise decision for Liberty. A vital leader on the club, the center fielder compiled a batting average of .415, which ranked second in the SSC, to go along with seven dingers and 34 RBI. He topped the league in both on-base percentage (0.535) and finished second in slugging (0.740), and added 46 runs scored in only 33 starts. Most notably, though, Liberty continued his traditional success at Saint Leo this season, recording his second cycle in as many years against the Lions back in April. Eased into the rotation at the start of the season, Acker has supplied the Sharks with arguably the toughest 1-2 combo on the mound in the SSC. The junior from Coral Springs, Fla. has compiled a perfect 6-0 record on the bump in 13 starts, highlighted by a complete-game effort against North Greenville on May 5. Since late March, Acker has tossed at least five innings in every start, raising his strikeout total to 81 over 70.2 innings for the season. His 3.95 ERA tops all starters on the NSU club. Lynn’s Patrick Dorrian was named SSC Player of the Year. Meanwhile, Tampa starter David Lebron repeated as SSC Pitcher of the Year, with Florida Southern’s Jacob Teter taking home Freshman of the Year honors. Tampa’s Joe Urso was selected as the SSC Coach of the Year.